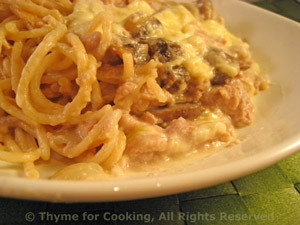 Dinner tonight: Tuna Tetrazzini, easy main course. This really only needs to bake long enough to melt the cheese and brown it slightly - you could just run it under the broiler for a minute or two. An easy variation on the traditional, made with turkey, this has a shorter baking time and less fussy 'assembly'. While pasta cooks: Trim and slice mushrooms. Heat oil in large skillet. Add onion and sauté until tender. Add mushrooms, garlic and sauté until vegetables start to brown. Add drained tuna, olives to skillet, stir to combine and remove from heat. Add floor and cook, stirring, 1 minute. To finish: Add 1/2 of the sauce to drained pasta, mix well to coat and put in baking dish, making a bit of a 'well' in the center. Add remaining sauce to tuna / vegetable mixture, stir well and spoon onto the pasta, leaving an inch (2.5cm) border around the edge. 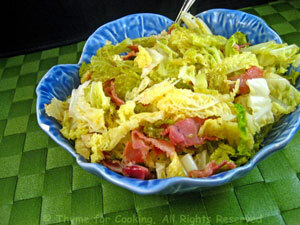 Sprinkle with cheese and bake until hot and bubbly, 10 - 15 minutes.